Support Wilton Court at the Palo Alto City Council Meeting. On November 5, Freebird Development and Housing Choices hosted the second of five Community Engagement meetings got City of Santa Clara residents with developmental disabilities and other residents to give input on an inclusive housing project currently planned at the intersection of San Tomas Expressway and Monroe Street. The participants provided feedback on traffic, parking, the site plan and massing and style of the project. The site will be developed as Inclusive Mixed-Income Housing, with 20% of the units targeted for Extremely Low-Income people with developmental disabilities. The units will range in size from studio apartments, to 1, 2 and 3 bedroom apartments. The project returns to City Council on December 11. Please join Housing Choices at this important City Council meeting. Please RSVP here or email andrea@housingchoices.org. Palo Alto Housing announced the Architectural Review Board (ARB) meeting on Thursday December 6, 2018 at 8:30AM at the Palo Alto Civic Center on 250 Hamilton Avenue, Palo Alto, CA. The ARB approval is the final approval needed before the Wilton Court project goes to City Council for approval, which is expected to take place in January 2019. If you would like to tell your housing story at the ARB meeting and stay updated about upcoming Palo Alto meetings and events, please fill out this form to join the Housing Choices Palo Alto Task Force. In October, Sand Hill Property Company was granted permission to begin demolishing parts of the Vallco Shopping Mall. Some may wonder, "What happens next?" The Housing Choices Cupertino Task Force will address this question at a meeting on Saturday November 17. A petition for a referendum of the Specific Plan has pushed Sand Hill Property Company to resort to the SB 35 development plan. The SB 35 plan for the Vallco site makes no mention of housing for extremely low income people with developmental disabilities, in contrast with the Specific Plan approved by City Council in September, which provided for 40 units of extremely low-income housing for people with developmental disabilities. 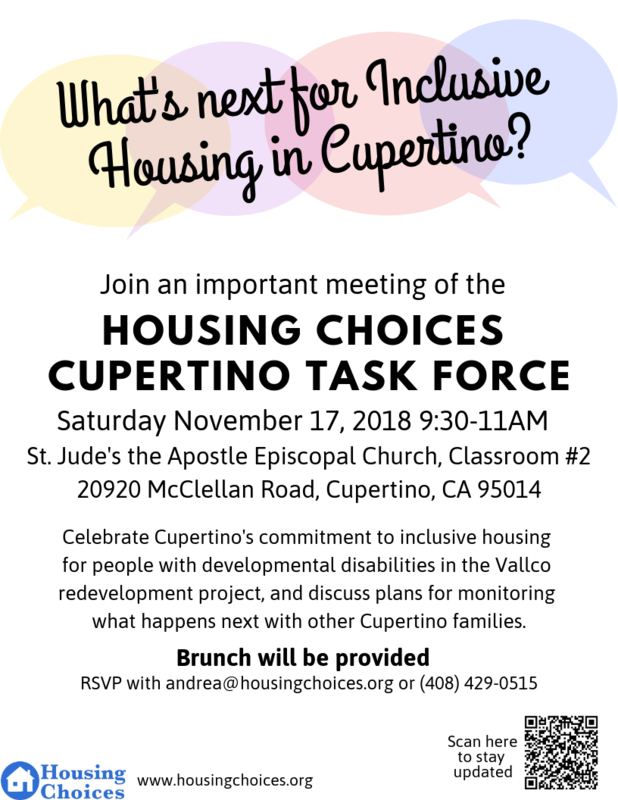 Cupertino families are urged to attend on November 17 and help create a plan for the future of inclusive housing in Cupertino. Brunch will be served. Please bring the entire family for this important gathering at St. Jude’s the Apostle Episcopal Church on 20920 McClellan Road, Classroom 2, Cupertino, CA on Saturday November 17 between 9:30 to 11 am. Please RSVP here or email andrea@housingchoices.org. Meet Palo Alto Housing’s new Executive Director, Randy Tsuda, and be inspired by Palo Alto’s Mayor Liz Kniss. Learn more about housing barriers and opportunities in Palo Alto and show your support for inclusive housing for people with developmental disabilities. Please RSVP here or contact andrea@housingchoices.org. After a planning process of more than a year, the Sunnyvale City Council will vote on a Development Agreement on Tuesday November 13 for a planned affordable housing project at the intersection of Mathilda and Iowa. The affordable housing units will be for extremely low, very low and low income residents. Twenty-five percent (23 of 91) of the rental units will have a preference for people with developmental disabilities served by San Andreas Regional Center. The City Council meeting will be held at 456 W. Olive Avenue, Sunnyvale, CA 94086 on November 13, 2018 at 7:00 pm. Please join Housing Choices at this important City Council meeting. Please RSVP here. Your participation will make a difference for people with developmental disabilities in the City of Sunnyvale. On November 6, election day, the ballot will include two statewide measures (Proposition 1 and Proposition 2) and several local measures to address the affordable housing crisis. In Santa Cruz County, Measure H would authorize $140 million in housing bonds to finance affordable housing for low- and moderate-income people, as well as housing for the homeless and first time homeowners. Register to vote online at www.RegisterToVote.ca.gov; the deadline to register to vote is October 22, 2018. On October 30, 2018, at 7 pm, the Sunnyvale City Council will consider entering a Disposition and Development Agreement with Related California for the construction of 90 units of affordable housing at a city-owned site at 463 Mathilda Avenue, at the Iowa Avenue intersection. Twenty-five percent of the units will be targeted to extremely low-income and very low-income residents with developmental disabilities served by San Andreas Regional Center. Located near public transit, the library, community services and shopping, the site is an ideal location for residents with developmental disabilities. The Imagine Disability Film Festival invites the community together around fellowship and films featuring individuals with developmental disability diagnoses. Food and beverages included with tickets which are now on sale. Costanoa Commons Farms is a place where people with and without disabilities can participate in their urban community farm, taking care of plants and animals, and creating friendships with one another that sustain everyone. Expanding our Horizons as we celebrate diversity, awareness and empowerment for persons of differing abilities. There will be art displays, a resource fair, games, live music, food trucks, movie screenings, and panel discussions! Housing Choices will have a table, so please stop by our table and say hello! The Supported Living Services (SLS) Orientation is a free event for individuals and agencies interested in developing a SLS program in Santa Clara, Santa Cruz, San Benito, and Monterey counties. You will learn about what SLS is, Title 17 SLS regulations, the philosophy of SLS, and more! Housing Choices Executive Director, Jan Stokley, will join a panel of housing advocates in describing the opportunities to design local inclusionary housing ordinances. The workshop on Inclusionary Housing 2.0 will examine local efforts to advocate for more inclusive market-rate rental housing, with a percentage of rental units targeted to people with diverse incomes and abilities. Click here to learn more about the NPH Conference. The City Council will be considering, and voting on, the Vallco Specific Plan. The Specific Plan includes 40 units of housing set-aside for people with intellectual and developmental disabilities. Contact jan@housingchoices.org if you are interested in getting involved! Join us for the Santa Clara Board of Supervisors meeting on September 11th! The supervisors will be voting on a proposal to allocate 5% of the Measure A housing bond for people with developmental disabilities. Come out to the Community Resource Fair hosted by the Housing Authority of Santa Clara County. Educate yourself about services offered by both non-profit and county agencies, learn about job training programs, and discover other programs and services focused on health, finances, and more! Housing Choices will have a table, so please stop by and say hi!